This past Saturday David Buuck presented at the Bowery Poetry Club for the Segue Series. I say “presented,” rather than “read,” as his reading featured video and song in addition to recitation. David has been exploring a very interesting range of problems in an expanded field of poetry for some time. Some of this is contained in his book The Shunt, which appeared with Palm Press in 2009. Yet the majority of it has been documented through pamphlets the poet-artist-theorist has put out himself, under the moniker BARGE, which stands for The Bay Area Research Group in Enviro-aesthetics, and more recently on Vimeo. 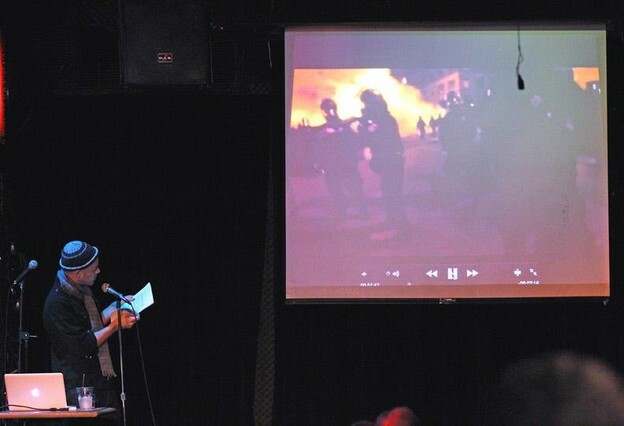 While I have long admired David’s performances, which blend constraint-based writing with movement, dance, and music, this Saturday had an added urgency as he addressed conflicts between participants in the occupy movement and police in his native Oakland. For years David and I have had an ongoing conversation about the uses (and abuses) of “reenactment” for public demonstration and aesthetic intervention. His 2008 work, Buried Treasure Island (which I discuss in a previous article at Jacket 2, on “Somatic Poetics”), features “pre-enactments” of what he hopes will be future ecological actions and sites, figured through the artist Gordon Matta-Clark for whom he has named a yet-to-be-remediated “park” on the island. Reenactment came up in a different way through the performance at Segue, where David first read what seemed to be a series of instructions for dance and/or movement (like ones a Yoga instructor might give, or he and I might give our students at Bard College’s Language and Thinking workshop). After reading these instructions — to bend your arm so many degrees, to place your chest on the ground, to exhale in a particular way — David proceeded to read from an Oakland police blotter, which he told me afterwards had been leaked by the hacktivist Anonymous only days before. The following exercise was generated for the course I am teaching this semester at School of Visual Arts, which concerns “composition through orality,” or if you prefer Creative Speaking. 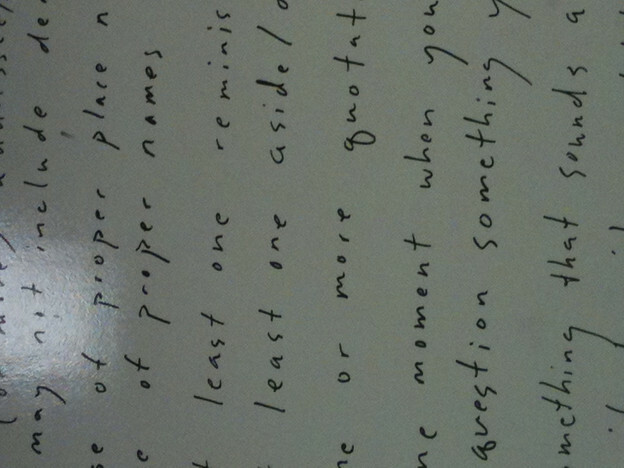 It is a “recipe” or constraint of sorts for writing a New York School poem (my class read James Schuyler, Bernadette Mayer, Charles Bernstein, and Dorothea Lasky—a heterodox selection, I realize; and listened to Eileen Myles, Schuyler, Robert Creeley, and Ron Padgett via PennSound).